Validation state for an interest packet. Definition at line 204 of file validation-state.hpp. Create validation state for interest. Definition at line 148 of file validation-state.cpp. If neither success callback nor failure callback was called, the destructor will call failure callback with IMPLEMENTATION_ERROR error code. Definition at line 159 of file validation-state.cpp. Definition at line 192 of file validation-state.cpp. 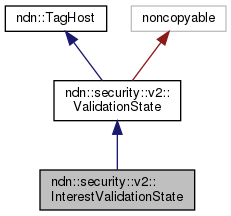 Definition at line 201 of file validation-state.cpp. Definition at line 235 of file validation-state.hpp.